When avid scuba divers and underwater photographers aren’t in the water, they are often dreaming about that next great dive vacation. 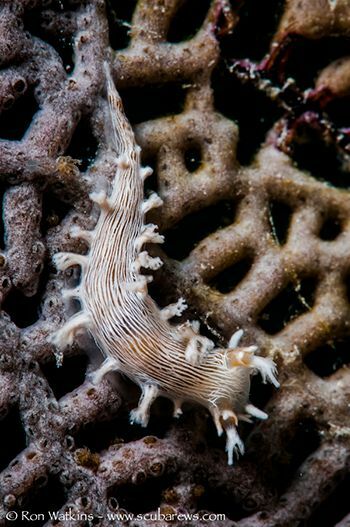 Maybe it is a place that has been on your bucket list for a long time (like Palau) or the latest hot spot for diving that you keep seeing in amazing photographs (like Papua New Guinea). The dream may be a great land-based dive resort like Wakatobi or that Socorro Islands liveaboard everyone is talking about. No matter how long that list of places you dream about has become, the realities of working for a living and family responsibilities limit your ability to check destinations off that list. Many of us, particularly Americans, work way too hard and only get to go on one or two major dive trips on a good year. Vacation days and budget are usually the two dream-busting constraints that stand between you and your dream dive trips. But what if you could minimize those two constraints and go on 8-10 dive trips a year? Sound like that "get rich" infomercial scheme that is too good to be true? Well it isn’t and for the last several months, that has been my goal and I have been averaging about 1-2 dive trips per month. My job requires business travel and I have looked at each trip as an opportunity to dive and enjoy my passion of underwater photography. Even if your job doesn’t require frequent travel, there often is the annual convention or user conference that gets you on the road at some point during the year. And what about those family reunions each summer, or the holidays spent at the in-laws? Whatever the reason or destination, look at how you may add a few days at the beginning or end of the trip to squeeze in some diving. Since your company (or you) are already planning the time and money to get there, make the most of it. Below is an example of how I maximized this approach on a recent business trip. I had a two-day sales meeting scheduled in Fort Lauderdale, FL and decided I was going to turn it into a dive trip. My company had planned for me to fly out on Monday for the meeting, so I decided I would fly out late Friday afternoon instead, using the long weekend to get in some diving. 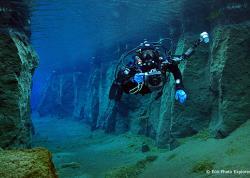 So with airfare booked and paid by the company I started my dive planning. 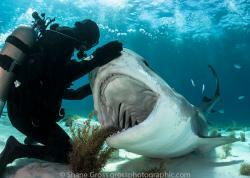 Fortunately, Florida has ample opportunity so I contacted my long time dive buddy, fellow photographer and Miami resident George Ordenes, to see what he recommended. He first recommended Blue Heron Bridge (BHB) which sounded fantastic since I hadn’t been there in awhile, and then suggested we take a drive down to the keys and dive the Spiegel Grove. Unable to decide on just one site, I decided to try and squeeze them both in. That would allow me to do some world class wreck, reef and muck diving all in one long weekend. A few days before the trip, I planned out my packing, which included my dive gear, camera equipment, and business dress for the sales meeting. I packed the business attire separately since I wouldn’t be touching it until later in the trip and stuffed my dive bag with minimal dive equipment. I threw in a few t-shirts, shorts, a pair of flip-flops, bathing suits and other bare necessities into my dive bag. I squeezed my DSLR wide-angle setup into a 36 pack AO cooler bag which I could carry on. The macro equipment went in my work backpack with my computer and the remaining miscellaneous items fit in the dive bag. A packing list always helps to make sure nothing critical is left at home. Fortunately for me, I was flying an airline that allowed me two free check-ins, a carry on and a personal item so there was no extra expense for baggage. 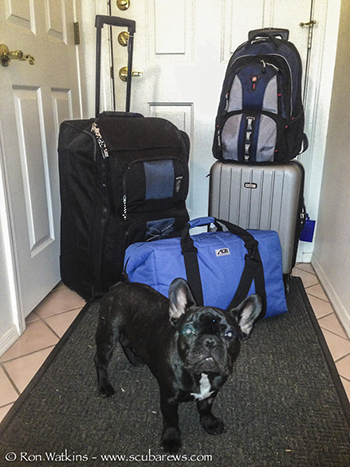 Two Checks bags and two carry-ons (Dog not taken on trip). After a 5 hour flight I arrived in Fort Lauderdale, rented my car and checked into an inexpensive airport hotel. In the morning I picked up George and we were in Key Largo before noon on Saturday. We checked in with Conch Republic Divers, with whom George had dove with in the past and highly recommended. The plan was for two afternoon dives on the Spiegel Grove as well as two reef dives Sunday morning. We boarded the spacious and well laid out Republic Diver boat with ample room for large cameras and dedicated rinse buckets. The USS Spiegal Grove is a 510-foot (almost 2 football fields) landing ship dock and was intentionally sunk in 2002. She rests in 130’ of water, but is reachable at 60 feet and with the majority of her decks resting at between 80’ and 90’. 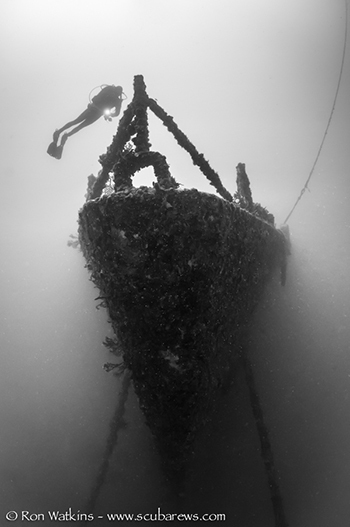 The visibility was about 70’ as we descended the bowline to her hull and entered the wheelhouse to begin our exploration. 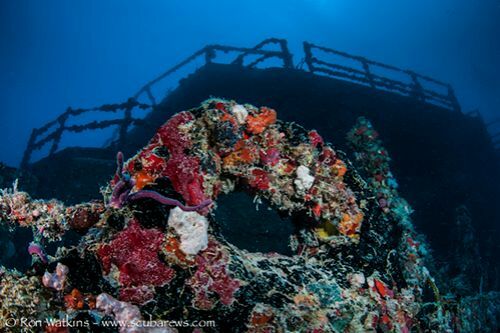 We then proceeded to her bow and explored the vast deck, which was full of colorful growth and several barracuda, large jacks and scrawled filefish. On the second dive we explored the stern of the ship and the large horizontal tower structure which was densely covered with sea fans and sponges. On the back deck we found the American flag and a dive flag that was fully extended in the slight current. A 6-7’ Goliath Grouper and large barracuda patrolled the stern as well as several large schools of jacks. 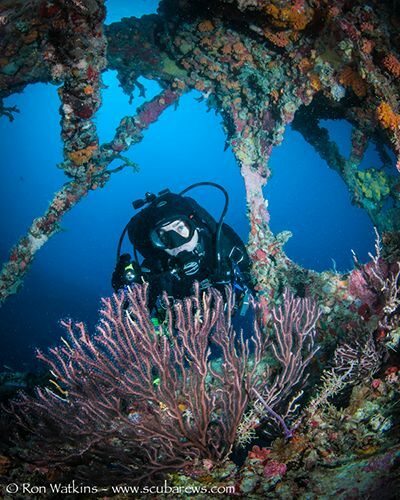 This was truly an amazing wreck dive! 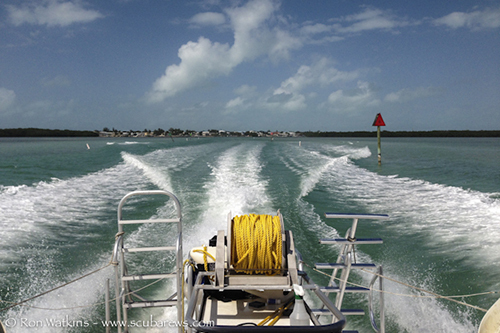 View as we race out to the wreck on the Conch Republic Diver boat. George exploring the massive bow of the Speigal Grove (F8, 1/200th). A large cleat encrusted with growth (F8, 1/250th). 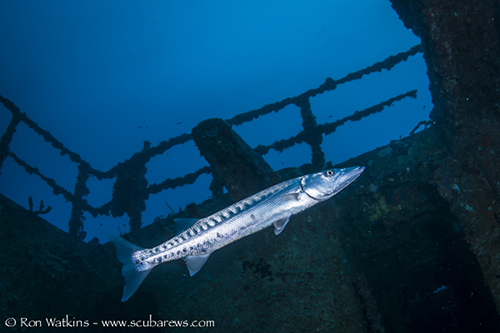 One of the many large barracuda patrolling the Speigal Grove (F10, 1/250th). 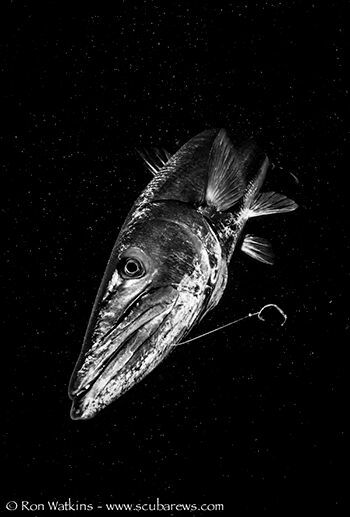 Large 6’ barracuda with a fishing hook in tow (F9, 1/160th). 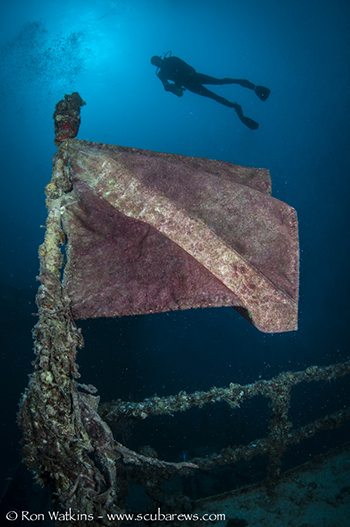 Dive flag flowing in the current on the stern of the Speigal Grove (F9, 1/320th). Sunday morning we woke up early and Captain Gary took us out to a shallow patch reef called Molasses Reef. I decided to shoot macro on the reef but regretted the decision as soon as I backrolled and saw the 100’+ visibility with large schools of snapper and healthy coral. We spent much of the dive exploring the spur and groove channels of the reef in awe of the density of marine life. We saw trumpetfish, parrotfish, filefish, nudibranchs, bearded fireworms, and large schools of yellowtail snapper. On the second dive I found a friendly scrawled filefish that approached quite close and allowed me to take several macro shots of his intricate blue and black patterns. 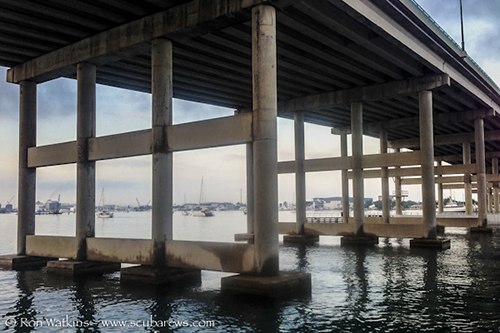 After two long dives at the shallow Molasses Reef, we sped back to Conch Republic Divers where we rinsed our gear dockside then hit the road for Miami, dropping off George and continuing my journey up to West Palm Beach. 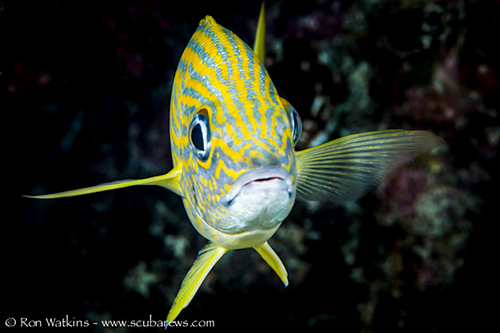 Read more on tips for fish photography. Blue striped grunt portrait (F11, 1/125th). 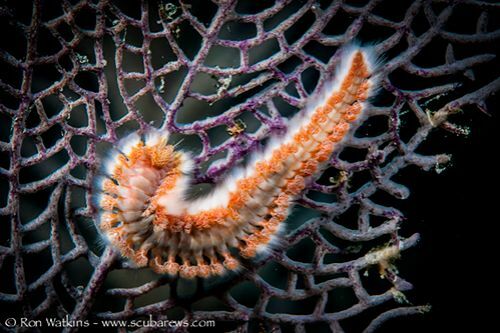 Bearded fireworm on a sea fan (F22, 1/250th). Red-tipped sea goddess super macro (F32, 1/250th, with diopter). 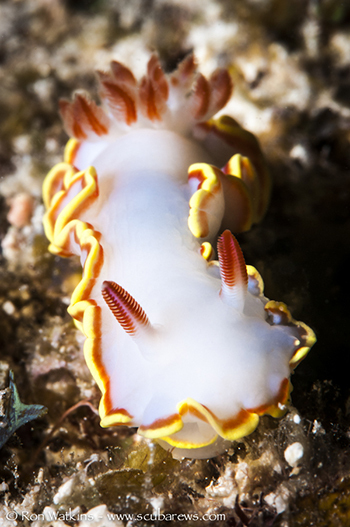 Tritonia hamnerorum sea slug on a sea fan (F29, 1/250th, with diopter). 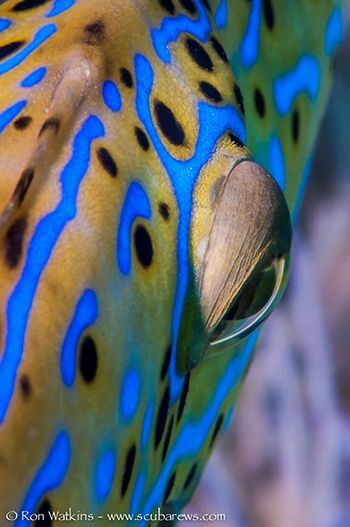 Close-up of scrawled filefish eye (F16, 1/100th). My next dive stop was in West Palm Beach at the famous Blue Heron Bridge (BHB) and its shallow muck dive site. I had planned ahead and checked the tide charts because it is best dove around slack tide for better visibility and less current. It's critical to get a parking permit from a ranger or dive shop because it is required to park at Phil Foster Park at night. I entered the water just before dusk and explored the East side bridge structure area for nearly two hours at a max depth of 22’. 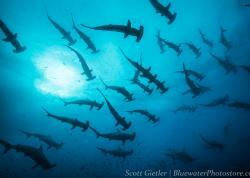 The visibility was only about 10’ at best but the diversity of life was amazing. 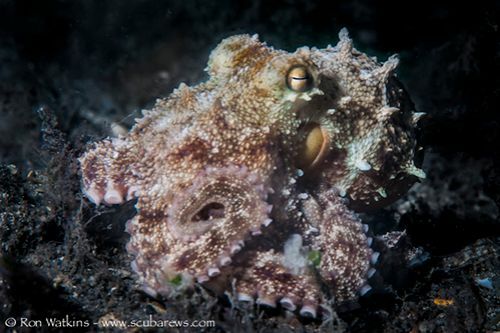 There were multiple octopus, tropical juvenile fish, crabs, shrimp, stingrays and scorpionfish. Juvenile bottom dweller (F22, 1/250th). 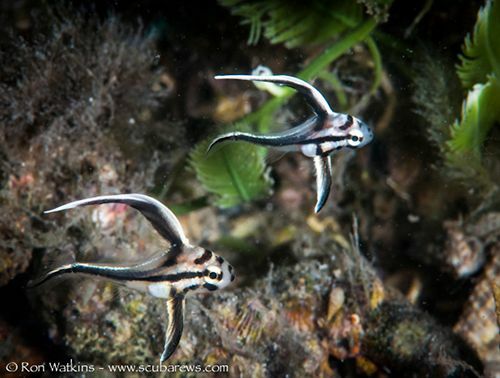 Pair of juvenile fish (F22, 1/320th). 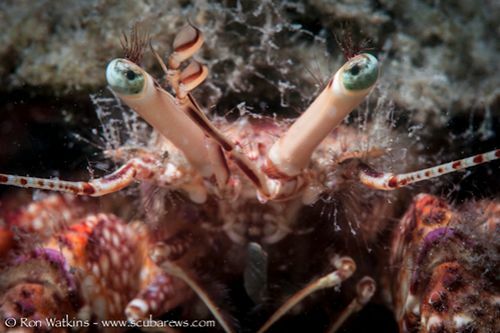 Close-up of Hermit Crab eyes (F22, 1/320th). Octopus on the move at night (F16, 1/250th). At 6:00am on Monday the alarm clock woke me from a dead sleep and it was time for one more dive at BHB before I started my workweek. This time I explored the many columns of the larger West side bridge area. The visibility was less than 10 feet again and the current was a little brisk but I still managed a bottom time of 105 minutes. 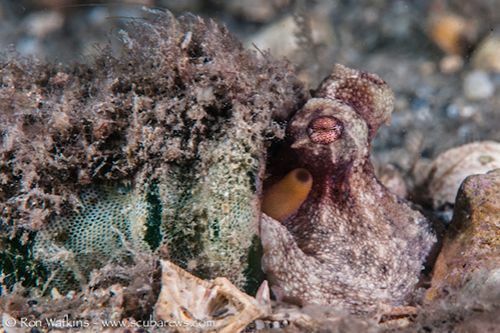 The East side had many of the same critters that I had seen the night before, but I found a large colony of jawfish, one of which was brooding eggs. I also found a couple of shy mantis shrimp and a colorful juvenile wrasse, along with more juvenile tropicals. 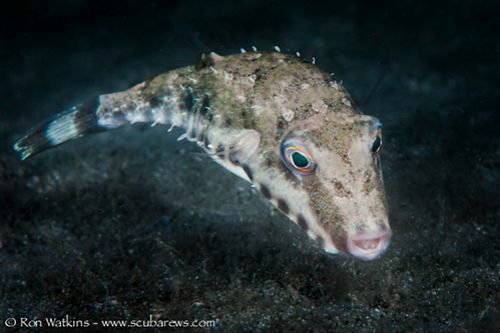 BHB never disappoints with diversity and is a must dive when in the area. The large columns of the West side BHB Bridge. 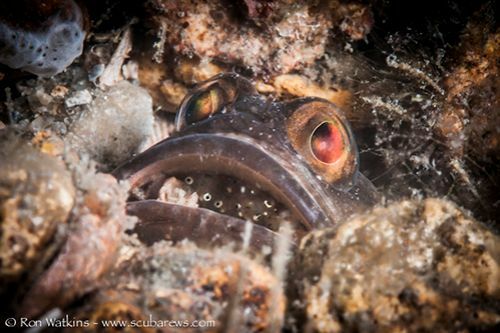 Shy Jawfish with eggs (F22, 1/250th). 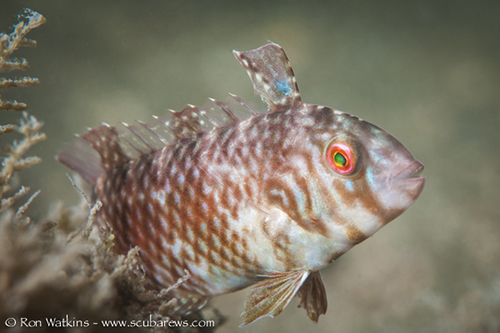 Colorful Juvenile wrasse (F16, 1/250th). Octopus in a bottle (F20, 1/250th). In addition to my Florida adventure business trip, I have also been diving in California three times this year on separate business trips. All of this diving was done without using a day of vacation and minimal expenses while on business trips. I hope this article has inspired you to look at your next business trip as an opportunity to dive or do something you love. We all need to work towards a better work/life balance. All of the above images were taken with a Nikon D300, Sea&Sea housing, dual YS-250 strobes, Tokina 10-17mm (at 10mm) or Nikor 105mm. Ron Watkins is an international award winning photographer and writer. He has been passionate about underwater photography since 1996 and his photography has appeared in magazines, websites, juried art displays, national aquariums, libraries and private collections. More of Ron’s photography may be viewed at www.scubarews.com and www.allwetportraits.com, which features his unique underwater portraits of children.